Not wanting to move to a World Line where Kurisu dies, Rintarō decides against the hacking. 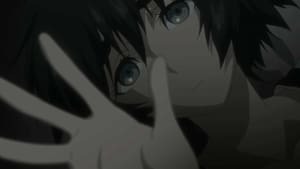 As he accompanies Mayuri to a Comic Market, he tries to think of a way he can save her without changing World Lines, too afraid to tell Kurisu the reason behind his change of plans. As a car appears during Mayuri’s fated time to die, Rintarō attempts to change her destiny by letting the car hit him instead, but Mayuri ends up dying trying to save him. After he leaps back in time, Kurisu has Rintarō reveal to her that she dies in the Beta World Line. As Rintarō finds Mayuri visiting her grandmother’s grave, he overhears that she’s been having dreams of the times she has died, and about how she has noticed Rintarō’s suffering.